The Annotated Adventure Time: Chaos and Spontaneity in "Varmints"
But with the new films, so comes new books, comics, and games in a new continuity to replace the old one. So, what is canon and what isn’t anymore? After twenty years, are these the same characters and planets we’ve always known and loved? Is it even the same universe? Well, in our column Canon Catch-Up, we’re here to answer those questions and set the record straight. Today, we’re discussing Luke Skywalker. So, what’s the deal with Luke Skywalker in the current continuity? Born at the end of the Clone Wars, Luke was one of two twins born from Padme Amidala and Anakin Skywalker. Amidala died shortly after the twins death, leaving them in the care of Obi-Wan Kenobi and Senator Bail Organa. Obi-Wan took Luke to his aunt and uncle on Tatooine and watched over the boy as he grew up on their moisture farm. Luke grew up believing his father was a “navigator on a space freighter,” though he took after Anakin in many ways. Frustrated his Uncle would not allow him to follow his dreams, Luke embrace a sense of adventure. By the age of 13, Luke was racing his friends through Beggar’s Canyon in his T-16 Skyhooper. When his friend Biggs Darklighter left to join the Imperial Academy (with the intention of defecting to the Rebellion), Luke became restless. Soon after, Luke’s Uncle Owen purchased the droids R2-D2 and C-3P0. While cleaning R2-D2, Luke discovered a message from Leia Organa pleading Obi-Wan Kenobi to come to Alderaan to help the Rebellion. After R2 went searching for Obi-Wan, Luke chased after him only to meet the Jedi Master himself, who revealed to Luke that his father was a Jedi. After stormtroopers destroyed his moisture farm and killed his Aunt and Uncle, Luke decided to join Kenobi in his mission to help Leia. They chartered a flight on the Millennium Falcon with Han Solo and Chewbacca, but when they arrived Alderaan had been destroyed by the Death Star. Through the Falcon was captured, it’s crew stayed hidden and infiltrated the Death Star. Through they managed to rescue Princess Leia, Obi-Wan fell to Darth Vader. After stealing back the Millennium Falcon, they fled to Yavin IV where Luke reunited with Biggs and participated in the Battle of Yavin. With the last second help of Han Solo, Luke managed to destroy the Death Star. He had become a hero of the Rebellion and joined its ranks. For the next three years, Luke Skywalker flew missions for the Rebellion and honed his basic Jedi skills. He found an abandoned Jedi Temple on Deveron where he honed his lightsaber skills. After helping destroy an Imperial weapons factory, Luke was corned by Darth Vader who recognized Luke using his old lightsaber. Luke barely escaped the encounter with his life, but Vader’s interest in the boy was peaked. He sent bounty hunters out to discover his identity. Hoping to study more Jedi techniques, Luke returned to Kenobi’s home on Tatooine only to be cornered by Boba Fett. Luke managed to escape with Kenobi’s journal, which made him decide to smuggle himself into Courscant in order to visit the Jedi Temple. By the time the Rebellion had resettled on Hoth, Luke was a Commander in the Alliance. After being attacked by a Wampa, Luke had a vision of Obi-Wan telling him to see out Yoda in the Dagobah system. Following the Battle of Hoth, Luke traveled to Dagobah where he studied under Yoda. Unfortunately, his Jedi training was cut short when he discovered his friends were being held captive on Bespin by Darth Vader. Against Yoda’s wishes, Luke went to save them and was trapped in a lightsaber duel with Vader. Vader won the duel and revealed he is Anakin Skywalker. He made an offer to join forces with Luke and rule the galaxy, but Luke refused. Luke had barely escaped, but lost his hand and his lightsaber in the process. Before returning to the Alliance, Luke visited Yoda one last time. Before his death, Yoda revealed that not only was Vader telling the truth but Leia was also his sister. The ghost of Obi-Wan appeared to Luke, explaining his heritage and urging him to confront Vader… but Luke decided to try to redeem his father rather than destroy him. Luke joined a strike team sent to the forest moon of Endor in preparation for a major alliance assault on the second Death Star. However, when he realized Vader could sense his presence he gave himself to Imperial custody. Despite Luke’s pleas to turn from the dark side, Vader brought Luke before the Emperor in the Death Star’s throne room. The Emperor worked to bring out Luke’s hate and anger, sparking a lightsaber duel between him and Vader. Near the end of the conflict, Luke used the dark side to seriously harm Vader. In that moment, Luke realized the pitfalls of the dark side. He rejected it and the Emperor altogether. In response, the Emperor tried to kill him with Force lightning. It was Vader who, out of love for his son, finally turned on his master and threw him down the shafts of the Death Star. Vader died in Luke’s arms, embracing the light side of the Force once again. Luke cremated his father’s body in a funeral pyre on the surface of Endor. After the Rebellion’s victory at Endor, Luke fought with them during their campaigns to push into Imperial space. Three months after Endor, Luke and Rebel pilot Shara Bey assaulted an Imperial research center to retrieve two Force sensitive trees from the Jedi Temple. He gifted one of the trees to Bey, who planted it near her home on Yavin IV. At some point, Luke and C-3PO traveled back to Devaron and the Jedi ruins there. Thirty years after the Battle of Endor, Luke Skywalker is still alive. What about Luke Skywalker in the Expanded Universe? Born on the asteroid Polis Massa after the end of the Clone Wars and the Jedi Purge, Obi-Wan Kenobi delivered Luke to his relatives Owen and Beru Lars on Tatooine. At first, Obi-Wan visited Luke every day but Lars would later forbid it. Luke grew up under his strict Uncle, adventurous despite Owen’s desire to abolish those tendencies. Luke developed skills as a pilot and a mechanic by flying his T-16 and repairing equipment on the Lars moisture farm. Known to his friends as “Wormie,” Luke saw them as his only respite from life on the desert. Eventually many of them left, feeding Luke’s loneliness. When the droids R2-D2 and C-3PO came into his possession, he discovered a message from Princess Leia that would send him on a journey that would have him leave Tatooine, meet Obi-Wan Kenobi, Han Solo, Chewbacca, and Leia. By the end, he flew as a member of Red Squadron in the Battle of Yavin and would become known as the pilot who destroyed the Death Star. Luke became a pilot for the Rebellion and his successful missions earned him promotions and soon his own command as a flight leader. He soon became friends with fellow Battle of Yavin veteran Wedge Antillies. Together, they assembled the X-Wing group known as Rogue Squadron. About three years after the Battle of Yavin, Rogue Squadron was transferred to newly established Echo Base on Hoth. When on a regular perimeter patrol Luke was attacked by a Wampa and had a vision of Obi-Wan telling him to seek out Jedi Master Yoda on the planet Dagobah. After covering the evacuation of Hoth during an Imperial siege, Luke flew to Dagobah instead of meeting up with the Alliance. After convincing Yoda to teach him, Luke underwent rigorous Jedi training until a vision beckoned him to Cloud City in order to save his friends. Little did Luke know that vision was a trap set by Darth Vader, who trapped Luke and tried to turn him to the dark side. After learning Vader was his father, Luke decided to fall to his death rather than join him. Luckily, he survived the fall and was rescued by the crew of the Millennium Falcon. Shortly after the encounter at Bespin, Luke rejoined the Alliance and was reinstated as Rogue Squadron commander. He fell in love with one of his squadron mates, Shira Brie, but on a mission Luke relied on the Force to find his target and destroyed Brie’s ship. Luke was put on trial, but it came to light that Brie was in fact an Imperial spy. Still, his confidence in the Force had been shaken. He returned to Obi-Wan’s home on Tatooine to hone his Force skills and build a new lightsaber while investigating Han’s location with Leia and Lando. When they learned Boba Fett was near Gall, Luke recruited the Rogues and the mercenary Dash Rendar to assist in his capture. They were unsuccessful. Shortly after the Gall operation, Luke and Rendar assisted a team of Bothans in discovering information about the second Death Star, despite the fact Black Sun had put a bounty on Luke’s head. When Leia was captured by Black Sun’s leader Prince Xizor, Luke, Dash, Lando, and Chewbacca infiltrated Xizor’s palace on Coruscant to rescue her. They managed to escape, but were caught in a space battle over Coruscant. During the battle, Vader destroyed Xizor for going after his son. After Fett delivered Han Solo to Jabba the Hutt on Tatooine, Luke and his friends enacted a plan to rescue him. They were successful in retrieving Han, but also managed to destroy Jabba and his crime operation in the process. Little did Luke know that one of the Emperor’s assassins, Mara Jade, had tried to kill Luke at Jabba’s palace but was unsuccessful. After learning Leia was his sister from Obi-Wan and Yoda, Luke rejoined the Alliance once again. During the Endor operation, Luke and Vader came face to face again before the Emperor. Through Luke almost turned to the dark side, he convinced his father to embrace the light side once again and overthrow the Emperor. Unfortunately, Vader was mortally wounded in the process. Before he died, Vader and Luke shared a final moment as father and son. After the Rebel victory at Endor, Luke participated in several campaigns at Bakura, Solay, and Mindor. However, only six months after Luke reached the rank of General of the New Republic… he resigned his commission to concentrate on becoming a Jedi. 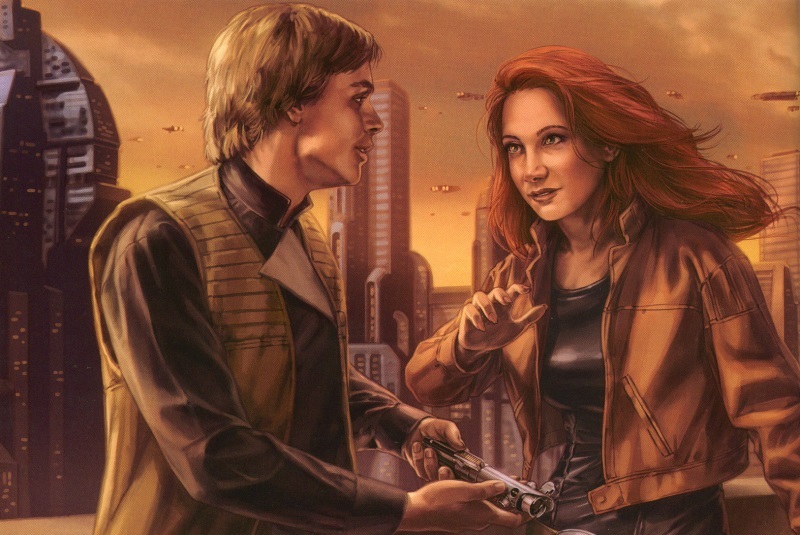 During the Thrawn campaigns, Luke formally met Mara Jade for the first time. Though she was still under orders to kill him by the long dead Emperor, the two had to work together to avoid Imperial patrols. Eventually, they formed a begrudging partnership against Thrawn and his minion: an insane Jedi clone named Joruus C’Baoth. Together, Luke and Mara defeated C’Baoth and became friends. Luke gifted her his old lightsaber, which he had recovered from C’baoth. It wasn’t long after however, that a clone of the Emperor returned to take control of the Imperial Remnant. Luke believed the only way to defeat the dark side was from the inside and became the Emperor’s apprentice… but the dark side took hold of him. It was only the intervention of Leia that redeemed Luke. Together they stopped the Emperor and his campaign against the New Republic. While recovering from his ordeal with the Emperor Reborn, Luke finally decided the Jedi Order needed to be reestablished. He created a Jedi Academy on Yavin IV from the Massassi Temples and gathered Force sensatives scattered across the galaxy. Though he suffered many wayward students, Luke managed to train dozens of Jedi for the New Republic in their fight against the Imperial Remnant. Shortly after the New Republic and the Imperial Remnant signed a peace treaty, Luke and Mara were married. Such happy times were short lived, however, when the Yuuzhan Vong War tore the galaxy asunder. Now battling an enemy that seemed to live outside the Force with lightsaber resistant armor, the Jedi as well as the New Republic were overwhelmed. System after system fell until the remnants of the New Republic were on the run, but eventually Luke and his fellow Jedi rallied around a newly formed government, the Galactic Alliance. Together, they discovered the secret to defeating the Yuuzhan Vong and restored peace to the galaxy. After the Yuuzhan Vong War, a debate waged inside the Jedi on their role in the new Galactic Alliance. Some thought the Order should serve and protect the Galactic reliance while others believed a broader and less hands on view should be taken. A schism within the Jedi Order formed, one that Luke’s leadership could not heal. Leia and Han’s eldest son, Jacen Solo, turned to the dark side and became a Sith Lord named Darth Caedus. Jacen led a force against the Galactic Alliance and the war was devastating. Many lives were lost, including Mara Jade’s. It was finally Jacen’s sister Jaina who defeated him. Jacen’s forces were stopped at the Battle of Kashyyyk, but the war had taken its toll on many… including Luke. The Galactic Alliance blamed the Civil War on Luke, exiling him for their space. Luke traveled with his son Ben, only for both of them to discover a lost tribe of Sith that threatened to destroy the Jedi. Luke came back to rally the Jedi against the Sith. They were victorious, but Luke and the Jedi Order he had created withdrew from the Galactic Alliance in order to act on their own accord. Eventually, Luke passed way and his spirit became one with the Force. His Force ghost would live on, however, and advise future generations. What does the Expanded Universe tell us about Luke Skywalker in the new continuity? For the most part, Luke has followed a similar trajectory in both continuities. It’s worth noting, however, that in the new canon Luke has learned more about being a Jedi prior to meeting with Yoda in The Empire Strikes Back. The biggest questions obviously occur after the end of Return of the Jedi. Where in the original extended universe Luke spent a good eight year fighting with the New Republic against the Imperial Remnant, it very much seems that the new canon is more interested in a quicker and dirtier fight between the two powers that culminated in the Battle of Jakku a year or so after the Battle of Endor. Following that battle, there seemed to be a time of relative peace which would have freed up Luke to attempt to reestablish a Jedi Order. Now, we have no idea how far Luke got in that process… but there is a rumor that Luke might have set up a Jedi Academy in the new canon similar to the expanded universe’s one on Yavin IV. We think that’s far more likely than Luke turning to the dark side or joining the First Order, but we’ll know more once The Force Awakens is released. While we’re waiting for more post-Return of the Jedi information, check out our previous entry of Canon Catch-Up about Y-Wings.